New People's Army rebels free four prisoners of war after more than 2 months in captivity in Mindanao. DAVAO CITY (Mindanao Examiner / Oct. 8, 2011) – Philippine Maoist rebels freed Saturday four jail officers after more than two months in captivity in Mindanao. Rubi del Mundo, a spokesperson for the New People’s Army rebels, said the prisoners - Police Inspectors Murphy Todyog and Eric Llamasares, Special Jail Officer 2 Rogelio Begontes and Jail Officer 1 Rolando Bajuyo Jr. – were released to the International Committee of the Red Cross on humanitarian grounds. 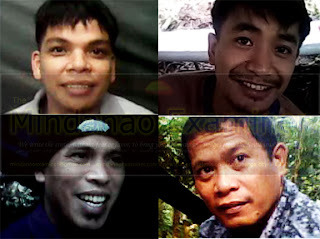 The four were seized by rebels on July 21 after a daring rescue of a rebel leader Dennis Rodenas in Bukidnon province while being transported to a prison facility in Davao. “Today, the New People’s Army undertakes the safe and orderly release of four of its prisoners of war in compliance with the political decision reached by the National Democratic Front of the Philippines,” Del Mundo said. The National Democratic Front of the Philippines is the political wing of the Communist Party of the Philippines which is currently negotiating peace with Manila. “And so today, as we release them to the International Committee of the Red Cross, to the third party intercessors that formed the independent humanitarian mission and to their families, it is our fervent hope they were able to have a better understanding of the roots of the armed conflict, the application of the principles and laws of human rights and international humanitarian law in the course of this civil war and the aspirations and revolutionary cause of the Filipino people,” Del Mundo said. The rebels are still holding captive Mayor Henry Dano, of Lingig town in Surigao del Sur; and his bodyguards Private First Class Allan Saban and Corporal Alrey Desamparado, who were seized August 6 in a daring raid on the politician’s house. Rigoberto Sanchez, a spokesman for the NPA’s Merardo Arce Command, said the politician is being tried by a revolutionary court on various criminal charges. The NPA accused Dano of recruiting militias to fight the rebels and violating civil rights of tribesmen and killing a tribal leader who was opposed to mining activities in Lingig town. Dano has appealed to President Benigno Aquino to stop military rescue operation to allow peaceful negotiations for their safe release. “I am asking for our beloved President, on my capacity as mayor of the town of Lingig and currently a detainee of the NPA, for the suspension of military operations to ensure our security and to facilitate for our early release from detention here, free from peril. I would also like to ask our beloved Governor, Johnny Pimentel, to send my request to our beloved President Benigno Aquino III, to suspend the military operations to accord us safety, and to hasten our freedom,” the mayor said.